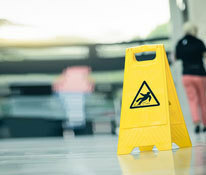 CleanSafe’s anti-slip floor treatment service offers complete protection from falls, trips and slips in your facility. CleanSafe Services applies the UK’s leading range of specialist commercial chemical products for sealing, renovating, and adding anti-slip coatings to floors. We have exclusive rights in mainland United Kingdom for contract application of products supplied by Bonasystems, the UK’s leading floor coating and cleaning product specialist. This includes Bonasystems Grip, used by blue chip companies across the UK to significantly and quantifiably reduce the risk of slips and trips, and the costs they incur.